This Thanksgiving our little butterball got her first turkey leg. She had to bare her teeth to prove that she was up for the task. LOL! We have that exact same plate and love it! hahaha, the vision of her as Pebbles Flintstone popped into my head! Haha I bet she had a ball with that bone!!!!! Wait!?! I thought Marlie was going to be a vegetarian? Does she actually eat the meat? I'm not sure if it is because Lewis doesn't have that many teeth or not but he spits out most meat so far. I love the plate! Happy Thanksgiving! I love Marlie's expression with her hand behind her head! LOL. Great picture! It looks like she gnawed right to the bone with those cute little teeth!! I love it! I wish I had lovely white strong teeth like that. If I were to try and eat the turkey leg mine would come right out attached to the meat. She certainly looks natural and relaxed too. Hope she enjoyed it. Adorable! She looks like she is up for the task! I'm sure she enjoyed it! Super yummy!!! 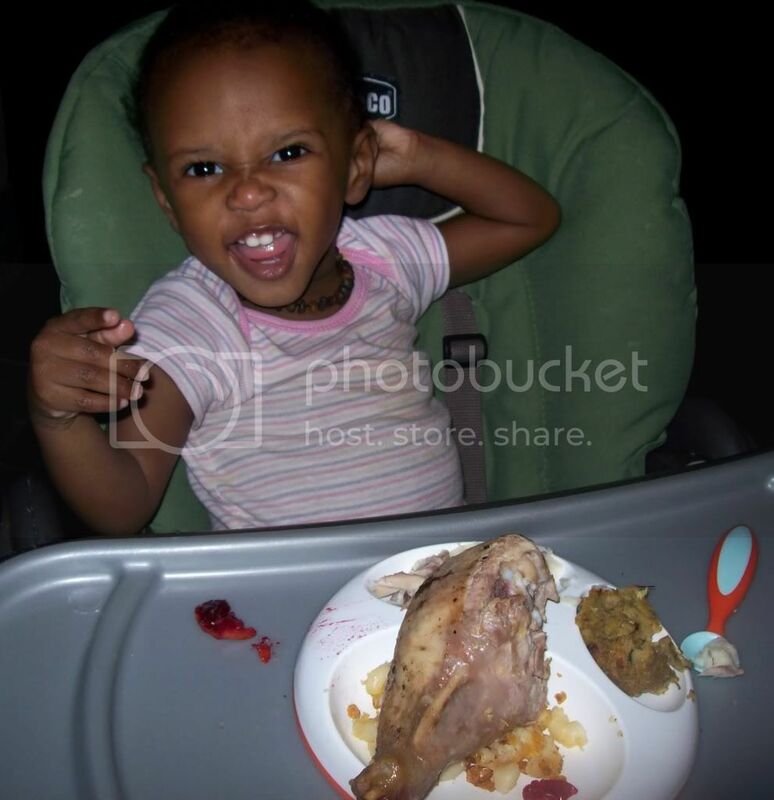 Looks like she has a wonderful Thanksgiving..She is adorable by the way!! how cute is she? hope she enjoyed thanksgiving. She looks ready to chow down! girlfriend can throw down! lol! She does look ready! How did she like it? Wow! What a great expression! Oh man! Did she really eat that? That's amazing :) Very, very cute! She looks like she's a bit "sassy!" Too funny! Love the teeth! Stopping by from This for That! Awww, how adorable! I'm here from this and That!